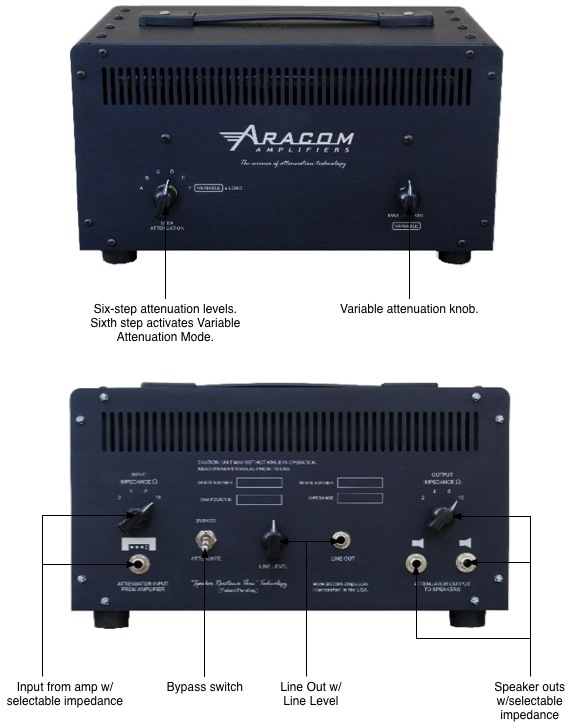 The venerable “Destroy All Guitars” shop has teamed up with Aracom Amplifiers to come up with a new version of the fantastic Aracom PRX150-Pro. Sporting a smaller cabinet (sorry, not reduced weight), and a couple of very cool new features, the $785 PRX150-DAG is the answer to anyone who wants to go to the extreme in transparent power attenuation. The PRX150-DAG is equipped with a High Frequency Cut switch, that rolls off the highs above 6KHz, that some users might find useful with amplifiers that have a pronounced high end frequency response. Some guitarists go to great lengths to control the high end response of their amplifier, by carefully selecting speakers, tubes, and other components to roll off the highs. Now with the PRX150-DAG, a guitarist might not need to rely on changing these components; the high cut filter switch allows the flexibility of rolling off the high end or not. The true bypass switch allows the filter to be completely bypassed, providing the full frequency response of the attenuated amplifier to pass through to the speakers. The other great feature is the Min/Max variable attenuation modes Jeff has introduced. Minimum attenuation mode is the traditional -16dB down to about -30dB variable attenuation, whereas the Maximum variable attenuation mode goes from -27dB to -40dB. With a 100 Watt amp, that’s taking down the output power to .015 Watt!!! Wanna have full dynamic response at bedroom levels with your 100 Watt amp? Look no further! The Aracom-DAG PRX150-DAG is available exclusively through Destroy All Guitars. Check it out! 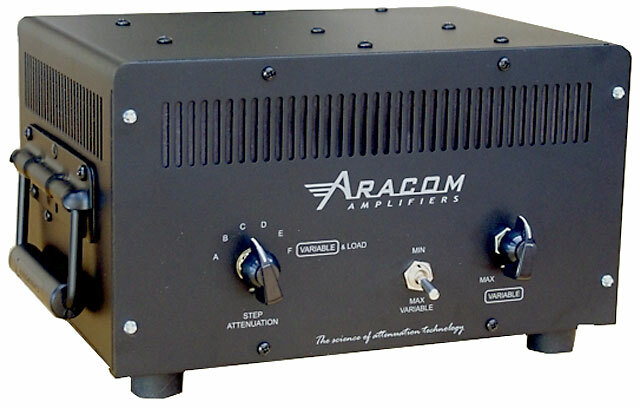 I’ve never hid from the fact that I own Aracom gear, and as I’ve said in My Rig page, I’m a faithful customer who just digs the stuff that Jeff Aragaki, Aracom’s founder, comes up with. I’ve extolled the wonders of his attenuator, the PRX150-Pro, and I’ve mentioned my Aracom amps, the VRX18, VRX22, and PLX18BB several times. One thing I’ve learned over the years with respect to gear is that you go with what works for you, and my Aracom gear simply works for me! In fact, my Aracom equipment has had a lot to do with me using less pedals, and relying on the raw sound of my guitar and amps; especially when I’m playing straight rock and roll. The rhythm part is played with my Squier CV Tele in the middle switch position, and running straight into Channel 2 of the PLX18BB, which was cranked up all the way. Talk about cranked Marshall-esque tones! It sounds even better live! The lead was recorded with my Gibson Nighthawk 2009 into my VRX22. Master was at 3pm and Volume was at 2pm. This setting gives me a sweet, singing lead voicing that sustains for days due to the awesome solid-state sag circuit! Again, the guitar was plugged straight into the amp – no frills whatsoever. I did add some reverb to both parts, but other than that, that the raw sound of the guitars/amps with no EQ. Pretty killer tones!!! To top it off, both parts were recorded at bedroom level as both amps ran into the PRX150-Pro! We’re talking conversation level, so if you heard some transient clicks in the clip, it’s stuff that was making noise in my garage/studio! You gotta check this stuff out. Jeff is a true wizard with amps! Both the VRX amps start at $895, while the PLX18BB combo starts at $1750 ($1350 for the head only). If you’re after vintage Marshall tone at a non-vintage price, you owe it to yourself to check out these amps!